Today I had my first CBT session and it’s made me realise I don’t want to face up to what’s going on in my head at all. I just want to take pills and let it all magically sort itself out. It’s hard work. I have to think about so much. I don’t know, I can’t remember! The only things I can think of are things that I’ve had to repeat to doctors about 500 times before. It’s hard to think what a state is like when I’m not in it. JUST LEAVE ME ALONE AND LET ME BE CRAZY. Eurgh, I know I don’t mean it but that’s exactly how I feel at the moment. Trying to work it all out has just spiralled me into one of those mixed states where I feel up and down at the same time leading to an impulsive, and slightly self- loathing, rant on a blog. The worst thing about it is that I don’t think my psychologist knows what to do with the CBT sessions. I’m not saying she’s incompetent, it’s just that I’m trying to use these sessions to deal with my thoughts when I’m depressed or anxious but when I go to the session I’m in my “normal” base line state. How are you meant to treat something that doesn’t seem to exist. For all she knows I’m making it up. Part of me wants to suddenly dip into depression, turn up at her office and then go from there. I’m hoping this is just a frustrated and slightly tired me being overdramatic about the whole thing. In fact, I think part of me knows that’s exactly what it is. After graduating last September, I’d decided that this was going to be the year that I went travelling. See the world! Do it all before I settle down. Unfortunately, the whole mental health thing got in the way. Travelling by yourself can be quite stressful at the best of times and I didn’t really want to put myself through any additional stress until I know I’m stable with my medication and have gone through my course of CBT. Having a crisis whilst I’m half way round the world didn’t sound very appealing! I’m still tempted to just pack it all in and leave but I’ve learnt that I’ve got to be patient. It’ll happen eventually and it’ll be so much better knowing I don’t have to worry about my brain going into meltdown every now and again. 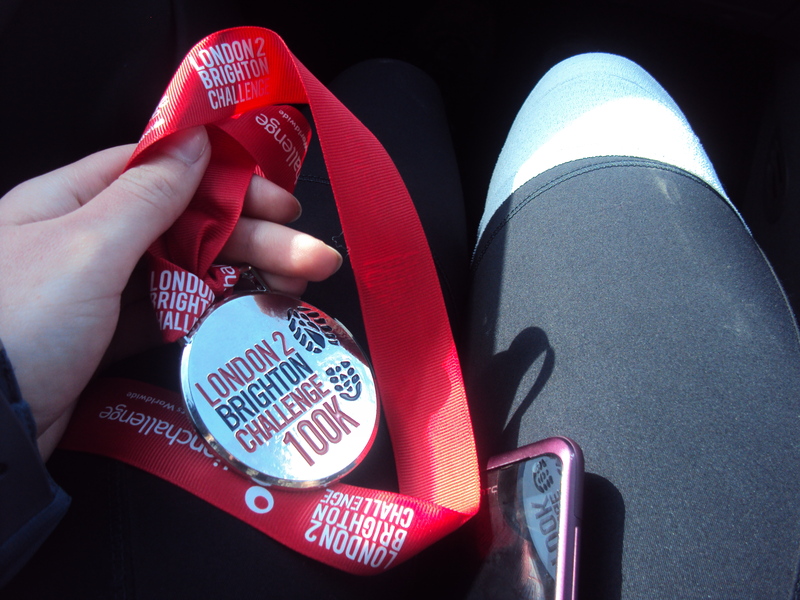 It was whilst I was obsessing about being stuck in London for the inevitable future that I came up with the idea of doing a charity challenge. Sounded like a pretty good idea. It would give me something to focus on, probably make me do some exercise to prepare for it and it would be raising money for a good cause. Perfect! Except, I knew one challenge wouldn’t be enough. I don’t know whether it was a little punishment for myself for having messed up my own travelling plans or whether I thought one challenge wouldn’t be enough to focus on but, I ended up choosing four. Yes, four. Four charity challenges over four months for four different charities. So far I’ve completed half of them and it’s been an amazing experience. London to Brighton was in May and it was incredible. I met a lovely group of people that I walked with most of the way and the atmosphere was incredible! Not only was it a physical challenge but also a mental one. It took me 27 hours and 46 minutes to complete (I could have flown to Australia in that time) and raised £539! I also managed to walk (hobble) away with a sprained knee. That part wasn’t as incredible. The second challenge, 3 peaks, was in June and I had two lovely friends that also did the challenge with me. I don’t know if they know it but it really touched me that they decided to join in on the challenge that was for Mind, seeing as I’d been quite dependent on that charity for a while. Unfortunately I only managed to climb the first peak due to my knee sprain gained from London to Brighton. I hadn’t really thought about what would happen if I got injured in a challenge. I was absolutely gutted but everything was made better getting to meet some amazing new people, knowing that I’d given it a go and raised £550. Tomorrow morning is the 10k run in Hyde park. I’m a little nervous because, you guessed it, my knee!! I have no idea if I can run for more than 5 minutes without it hurting again because I haven’t been able to train. Oh and I hate running. That may be a small factor. Wish me luck! I have to say, past me was a little bit of a genius when she came up with this idea. Not only am I getting to help others but it’s helped me so much. It’s given me something to focus on. Whenever I’ve felt down there’s always been a little thought floating through my head that I may not be as worthless as I think I am at the time because of these challenges. A part of me wonders what I’m going to do once they’re finished. What am I going to focus on to convince myself I have self worth when I’m feeling low? Hopefully, by that time, the CBT sessions will kick in and I’ll be handling it like a pro. Only time will tell I suppose!